I have some depth distribution data for a number of species of marine fishes. 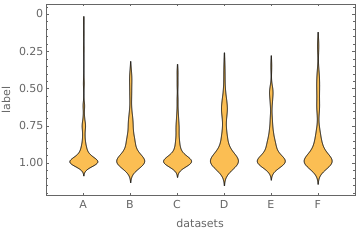 Since I am dealing with depth distributions it is more conventional to plot such distributional diagrams with the surface (0 m) at the top of the chart and the greatest depth at the bottom. 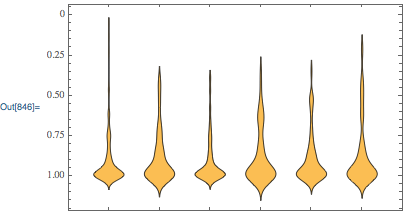 How can one reflect the vertical axis when using DistributionChart so that the "surface" (0 m) is at the top of the frame and the greatest depth is at the bottom? I've read over the options and other questions but don't seem to find a solution. Getting over Mathematica Bar Chart Limitations…. How to specify custom “ColorScheme” for “GradientScaleBoxWhisker” ChartElementFunction and Whiskers & Fences of BoxWhiskerChart?